Spoiler Warning! This review talks about the plot of the graphic novel being reviewed. Read at your own risk! 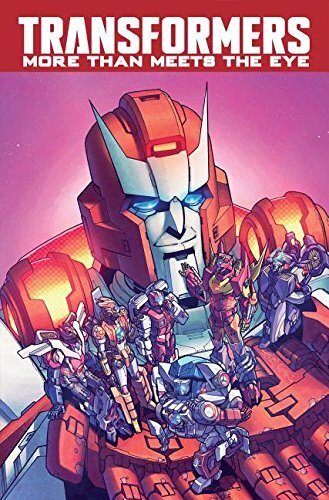 I’ve waxed rhapsodic about the high caliber of IDW’s myriad Transformers series in a few previous reviews, but I believe this is the first time I’ve written a review for More Than Meets the Eye, the true stand-out of the past ten years of Transformers comics. Roberts and the rotating art teams for MTMtE never cease to amaze me with their masterful storytelling. This is easily one of the finest science fiction comics on the market today, and to pass it up is to be missing an absolute wonder. Even if you aren’t a Transformers fan, I cannot recommend More Than Meets the Eye highly enough. For those unfamiliar, More Than Meets the Eye follows the Lost Light, a ship led by the Autobot Rodimus and, more recently, perennial franchise antagonist Megatron, who denounced his Decepticon army to join his mortal enemies. The crew of the Lost Light are a ragtag band of second-string Autobots who have grown into a nuanced, interesting ensemble cast over the course of MTMtE. They search the galaxy for the legendary Knights of Cybertron, who are comparable to the Knights of the Round Table, but they can’t stop getting sidetracked. Hijinks and tragedy in equal measure ensue during every detour. A great strength of this incredibly strong series has been the character work, and the first story in this collection, “The Permanent Revolution,” gives a closer look at a recurring antagonist named Tarn. Tarn leads the Decepticon Justice Division, a brutal squad of sadistic Decepticons tasked with eliminating undesirables from the ranks, and in this issue, we learn that his iron-fisted command is tempered by fiddly micromanagement and Personal Development Plans. This stark contrast exemplifies the book’s wry sense of humor, but the story also reminds the reader that Tarn believes wholeheartedly in the Decepticon cause, which he believes to be the elimination of all organic life. Seeing Megatron’s public denouncing of Decepticonism pushes Tarn to ally himself with a renegade warlord formerly on the DJD’s list. Up to this point, Tarn has been interesting as a villain, but not fully realized as a character, which changes in this story. The second issue, another one-issue story, is about Autobot medic Ratchet leaving the Lost Light. The beginning demonstrates that Ratchet hates good-byes and can never do it adequately. Gradually, over the course of the issue, he has final conversations with his closest friends under the pretense of medical examinations, but in the end, he leaves a letter for the crew in a scene that deeply moved this Transformers fan. To see such a character arc in the space of one issue is astounding. In the third story, which takes place in two issues, Nautica faces pressure and anxiety when she awkwardly reunites with her oathbound best friend, with the possibility of being ostracized from her society if she breaks it off. Not only does this beat expound on the norms of Nautica’s lost colony, thereby expanding the IDW lore, it gives readers a relatable anchor; many people feel pressured to have friends, even if they don’t feel entirely comfortable with a specific friendship. Swerve’s character arc pays off in the fourth story, where we see the resolution to the feelings of loneliness and inadequacy that have shadowed his role as a comic relief character. And in the last story, Nightbeat confronts the Cybertronian Grim Reaper after coming back from the dead, another pay-off, as the skeptical detective hasn’t previously had the chance to cope with his death and resurrection. More Than Meets the Eye is also chock full of high-concept sci-fi ideas. The two-issue arc in this collection features “personality ticks,” parasitic creatures that feed on desirable traits like “charm, humility, and charisma.” However, they are also so good at blending into a crowd that they deflect light and attention. The method of killing them is by a “charisma overload,” which the Lost Light achieves by bringing Rodimus and Megatron into the same room. The way Roberts creates threats tailored to such specific targets, with such unique solutions, is a hallmark of the book, and the plotting is meticulous. In Swerve’s story, his body is shutting down while his mind projects a solid hologram model of Earth behind the Lost Light, assembled from a four-week binge of consuming every cultural artifact humanity has ever produced. Its size is a side effect of a “meta-bomb” making him increasingly self-aware of his fictitious nature combined with a localized time loop from a brush with a time machine. The intertextuality and metatextuality in this issue are extensive, and while that can sometimes be difficult to execute, this is one of the best issues of MTMtE to date, because of, rather than in spite of, the post-modern elements. I’ve said before that Transformers artists need to be able to portray characters emoting when many of them have visors, faceplates, or both. Each artist accomplishes this with aplomb, particularly Hayato Sakamoto, who drew the Tarn-focused issue. Tarn is a particularly extreme example, because he wears a mask in the image of the Decepticon insignia. Most Transformers artists find a way to make faceplates act similarly to mouths, but this is impossible with Tarn, so artists drawing him must rely on eyes and body language. Sakamoto is apparently up to the task, as Tarn is just as expressive as any other character. My final bit of praise for More Than Meets the Eye Volume 8 is that it continues the recent trend of increasing the number of female Transformers, introducing a female medic to the DJD and Nautica’s friends Firestar and Velocity, the latter of whom has joined the Lost Light. All told, MTMtE volume 8 is one of the strongest installments of a great series. I’m always impatient to read more, and I can’t wait to see where Volume 9 goes.